Have you ever looked forward to a meeting of a group of people, knowing in your spirit that it was going to be an appointed time of the Lord's? That is what happened to me these last few days. A seemingly random text about what was on our calendar turned into three days of renewing old friendships, making new ones, and all of it exalting the Lord. But this post is about more than relationships built on common faith. For me, the lone woman in the group, it was about being in the presence of faithful men who embody what it means to be a Spiritual Warrior. It was about observing strong men who are seeking the heart of God; men who aren't afraid to be vulnerable if it means their lives can have an impact on this world for the Kingdom of God. These are men who have found renewed purpose in their lives; who have made a commitment to put God first above all else, and to unpack the truths of Scripture while uncovering and exposing the lies of religion and false doctrine. In other words, these are men of character, determined to press into God and know Him fully, and to know who they are in Christ. And, oh yeah, they aren't afraid to stand against the spiritual darkness that might threaten them and their families, nor to take back territory from the Enemy. The definition of a warrior is this: One who is engaged aggressively or energetically in an activity, cause, or conflict. The cause of these men is the Kingdom of God, and they are aggressively pursuing it in their lives and energetically advancing the message of that Gospel. Each has fought his own spiritual and demonic battles, and come out victorious on the other side -- because they knew that Jesus had already defeated those demons; they just had to partner with Him and be in agreement that they are Overcomers. They are now equipped to lead others into the battles for their lives, and to model what it means to have a new identity in Christ. I had the privilege of listening to Godly men claim their authority to use the power of God [that is in them] to manifest His presence on this earth. They are warriors who no longer desire to cling to the powerless doctrines of men that instruct us to accept unanswered prayers, or to assume that all suffering and persecution is God's means of revealing our areas of weakness and wrong attitudes in order that we might humble ourselves before God and He can accomplish His purpose in our lives. We do not serve a God who condones cancer or poverty or shame or guilt in order to cause us to seek Him. He has given us His authority, as Believers, to use His power to conquer the schemes of the devil, thereby glorifying Him in the spiritual realm. These are men that believe that concept and who no longer accept the lies that Satan tells them; truthfully, they know who they are ... men seeking holiness and righteousness in the image of Christ. 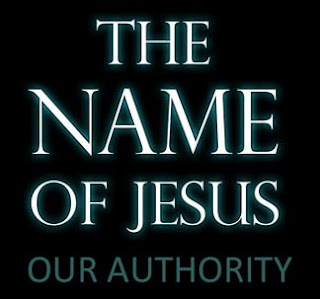 And they know that the authority given to them by the Word of the Lord is not power unto their flesh. It means they've been given the right to give commands and take action (as Spiritual Warriors) against Satan; against sin; against sickness, infirmity and disease; against themselves [by just saying "no" to temptation and sin]; and against any situations or circumstances in which they or others find themselves. But perhaps, more importantly, they know that this authority they wield is backed up by the Power of the God of the Universe, through the Holy Spirit. In fact, they are on intimate terms with the Holy Spirit and dependent on His power to back up their authority. They have no qualms about following what Jesus has taught them through His Word, and they are ready to do whatever the Holy Spirit leads them to do on a daily basis. It was so edifying and encouraging to hear them proclaim their total dependence on Jesus; listening for His instructions in their lives. They know, without a doubt, that it's not enough to KNOW what Jesus desires of His followers; they must be committed to DO IT! In short, as women of the faith, they are what we would want in a faithful man who is willing to take on the role of Spiritual Warrior: fearless. They don't ignore Satan or his demons; nor do they go looking for a fight -- but they resist him when he comes calling. And for them, that means submitting to God and listening to Him like a sheep that follows its Shepherd ... but resisting like a lion, confident that the enemy will flee. And they understand [that at times] the battle will be won easily and swiftly; while at other times, they may have to stand for awhile, and then ... continue to stand until the enemy leaves the field of battle. And perhaps the most enlightening aspect of spending time with these warriors was the overriding desire to be obedient -- it was the realization that Jesus has already defeated our Enemy; by dying in their place, and accepting the punishment for their sins and those who sinned against them, Jesus has satisfied God’s righteous anger against them, men who believe. They are covered by His blood and healed by His stripes. They don't just know the meaning of Propitiation; they live it. In wrapping up my experience this past week with these inspirational warriors, I want to borrow from the words of Andrew Wommack, who is a well-known proponent of our Authority and Power. I believe that he accurately describes the theology that is represented by the lives of "my" Spiritual Warriors. They are authentic in their belief that "[Jesus] deposited His resurrection power inside every believer. He’s done His part, and now it is up to us to do ours. We need to take the authority He has given us and become commanders instead of beggars". My warriors will not beg God to deliver them from every sling and arrow of the devil. They will step up and be the Warriors that God made them to be, and use the authority they have been given by their Creator to call upon His power [inside them] to establish this world as His Kingdom. They are battle-tested and battle-ready. And even more precious to us women, they protect, shield, guard, encourage, and love their families. And I'm proud to call them my husband, my "spiritual son", and my spiritual "brother" in Christ. May God strengthen them, nourish them, and sustain them in their purpose for His Kingdom. I know that crowns await them in heaven. Ephesians 6:10 "In conclusion, be strong in the Lord [draw your strength from Him and be empowered through your union with Him] and in the power of His [boundless] might."